Carbon dating has led to the significant breakthrough, which categorically proves samples of hazel charcoal, unearthed from an excavation of a simple wattle and timber structure on Iona 60 years ago, dates back to the exact period Columba lived and worked at the Inner Hebridean monastery. It may be the monk's 'cell' where he prayed and studied in isolation. The samples, excavated in 1957 by British archaeologist Professor Charles Thomas, were kept in his garage in Cornwall, preserved in matchboxes, until 2012 when they were given to Historic Scotland (now Historic Environment Scotland). A University of Glasgow team of archaeologists identified the significance of the finds and recently submitted the samples for carbon dating. St Columba, known in Gaelic as Colum Cille 'the dove of the Church,' is widely revered as a key figure who brought Christianity to Scotland from Ireland, landing on Iona in AD 563. 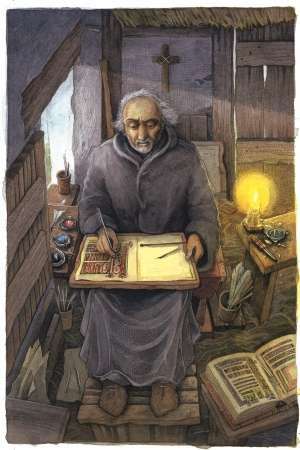 In the 'Life of St Columba,' written 100 years after his death by his successor Adomnán, he described Columba writing in his cell on a rocky hillock, called Tòrr an Aba or 'the mound of the abbot,' within the monastery looking out his door towards the mountains of Mull. When Professor Thomas' team excavated at this site 60 years ago, the carbonised remains of wattle walls of a small hut were unearthed below layers of loose beach pebbles, suggesting the wooden structure had burned down and the area deliberately filled over. The site was later marked with a cross. Until recently the finds from the site were believed to be missing, but a project led by University of Glasgow archaeologists Dr Ewan Campbell and Dr Adrián Maldonado, funded by Historic Environment Scotland, re-located the samples. Commenting on the findings, Dr Adrián Maldonado said: "This discovery is massive. St Columba is a key figure in Western Christendom. He was the national patron saint of Scotland in the Middle Ages. "We were granted access to the original finds from Charles Thomas, and we could work on his notes and charcoal samples which were excavated in 1957. Luckily Thomas kept hold of them, as he knew they were important, and because they were kept dry, they were still in a good condition. "Thomas always believed he and his team had uncovered Columba's original wooden hut, but they could never prove it because the technology wasn't there. Radiocarbon dating was in its infancy, it had only been discovered a year earlier in 1956, so there was not a lot they could do with the samples. "So for us, 60 years later, to be able to send the original samples off to the radiocarbon dating labs and have them come back showing, within the margin of error, as something which may have been built in the lifetime of St Columba, is very exciting. "This is as close as any archaeologist has come to excavating a structure built during the time of St Columba, and it is a great vindication of the archaeological instincts of Thomas and his team. It is a remarkable lesson in the value of curating excavation archives for as long as it takes, to make sure the material is ready for the next wave of technology." Through the services of the Scottish Universities Environmental Research Centre (SUERC), the world-leading centre for scientific analysis, they decided to carbon-date the hazel stakes and the results show the hut dated back to AD 540-650. Columba died in 597AD. Altogether, 10 radiocarbon dates were returned from samples from Thomas' excavations, all dating to the early medieval period (AD 500-1100). Although the excavators of the hut had argued it was likely Columba's cell, the lack of dating technology at the time led many archaeologists to dismiss the findings as speculation and scientifically unproved. Professor Thomas Clancy, Celtic and Gaelic historian at the University of Glasgow, said: "The results of the radiocarbon dating are nothing short of exhilarating. The remains on top of Tòrr an Aba had been dismissed as from a much later date. Now we know they belonged to a structure which stood there in Columba's lifetime. More than that, the dates, and our new understanding of the turning of the site into a monument not long after its use, makes it pretty clear that this was St Columba's day or writing house. From here, he oversaw the day-to-day activities of his monastery. "Even more exciting, we may even have a manuscript written in Columba's 'little house'. The 'Cathach,' a manuscript of the psalms was long been reputed to be Columba's own writing, and which is certainly one of our earliest manuscripts from this part of the world, dating to Columba's time, was certainly written on Iona. If Columba indeed wrote it, and I see no good reason why he shouldn't have, it was likely in the 'little house' whose remains have now been pinned to Columba's own lifetime." Richard Strachan, Senior Archaeologist at Historic Environment Scotland, said: "The results of this recent work are hugely significant and really exciting. The radiocarbon dates have confirmed the Tòrr an Aba structure excavated in the 1950s to be consistent with Columba's presence on Iona in the 6th Century AD and provides compelling evidence this was Columba's writing hut, as described by Adomnán. "It endorses Thomas's meticulous curation of his archive for over 60 years ago and demonstrates the huge value in its re-examination. 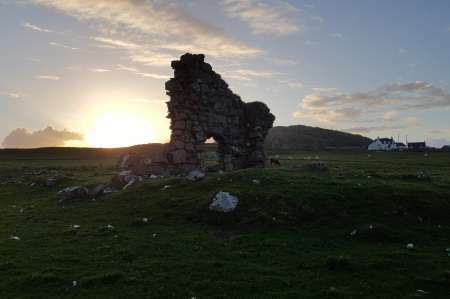 The team at the University of Glasgow has done an amazing job synthesising his extensive excavation, and combined with the considerable other archaeological work of Iona definitely add up to more than the sum of the parts. It is a huge regret that Professor Thomas did not live to see these results." Campbell and Maldonado recently re-opened some of Charles' trenches on Iona to gather more dating material. Some of the early findings of this work are being unveiled at today's keynote lecture for the 8th International Insular Art Conference being held at the University of Glasgow this week.